There has been a debate on social media about the cost of pitch hire in the Causeway Coast and Glens Council area, with prices ranging from £22 in the former Moyle Council area to £35 in Coleraine and £42 in Ballymoney. It is thought that the Council will meet soon to discuss the standardisation of the hire charges but could an increase for some clubs lead to difficulties at a time when there has been an increase in the number of local teams folding. Danny Hickinson from Ballybogey is frustrated. His club have been enjoying success in both the league and cup competitions, however, the more success they have, the more it’s costing the club. “The costs are crippling,” said Danny. “I have asked about the cost of hiring pitches before and have been told it’s being sorted but we are still waiting. I don’t see why you can pay £22 for a pitch in Ballycastle, yet we have to pay £42.30 in Ballymoney. When you add that to the cost of a referee you are talking between £80 and £90 each time you play at home. “We are fortunate to be enjoying success on the pitch and have had a good run in the County Antrim Junior Shield but that has cost us £600. We have still eight home games left in the league so we are talking around £800. If we only had £22 to pay the same as the Ballycastle teams then that £20 extra would make a big lot of difference to us. Clubs in the former Moyle council area could feel the pitch price pince more than others and Ballycastle Football Club commented: “By far our biggest outgoing is on pitches, so any increase will severely affect the opportunities we offer to the youngsters in the area. However, we can’t really complain if there is parity across the council if, and only if, there is also parity in the quality of services. Glebe Rangers field three teams each week. The Old Boys in the Hutchinson Tiles league, the Reserves in the C&D Morning League and the Senior side in Championship 2. Club Spokesman John McAuley felt that any changes to the normal pitch hire wouldn’t impact on the club as they were already paying the highest rate adding: “If the cost is reduced a bit then obviously we would be delighted, however I would also be happy if it stayed the same but only if there was a good maintenance programme and the pitch was playable all year round. “We have the same situation year in year out whereby the pitches are hired out and are going from 5 or 6pm to 10pm, Monday to Friday as the council try to squeeze as much money out of them as possible. Next thing they are closed for weeks on end because they have been overused and there has been little or no maintenance which means the council loses money. In fact we now train one night a week at Dalriada’s 3G pitches and there are many other clubs doing the same thing. 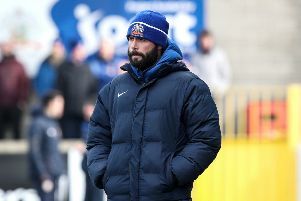 “There doesn’t seem to be anyone at the council who cares and missing training sessions can impact greatly on how the team plays at the weekend which can ultimately affect whether we survive in Championship 2 or not. If we get relegated there won’t be a team from Ballymoney playing Championship football which would be a disgrace. “At one point a decision by the Council to close the Stadium pitch put our place in the league in jeopardy. The Council said they were closing the pitch but we explained that we needed to have an official inspection carried out. If they had closed it they would have put us in breach of IFA rules and they could have kicked us out of the league. We had to go to MLAs and Councillors to prevent them doing it and in the end the game was called off after the pitch inspection. Apart from Ballymoney Youth using it an odd time there is only us on it and if we get relegated then who would use the Stadium? So ultimately the council will lose out again.